How many textures and patterns can you see here? Del Kathryn Barton painted this patterned self-portrait not long after her mother died. Her pet bulldog Cherry-Bomb sits on her shoulder like a protector, keeping an eye on her as she grieves for her mother. Look at the way the patterns follow Del and Cherry-Bomb’s outlines and expand across the canvas. Notice how her hands reach towards the leaf as she thinks about her beloved mother. Who would you like to protect you during a sad time? 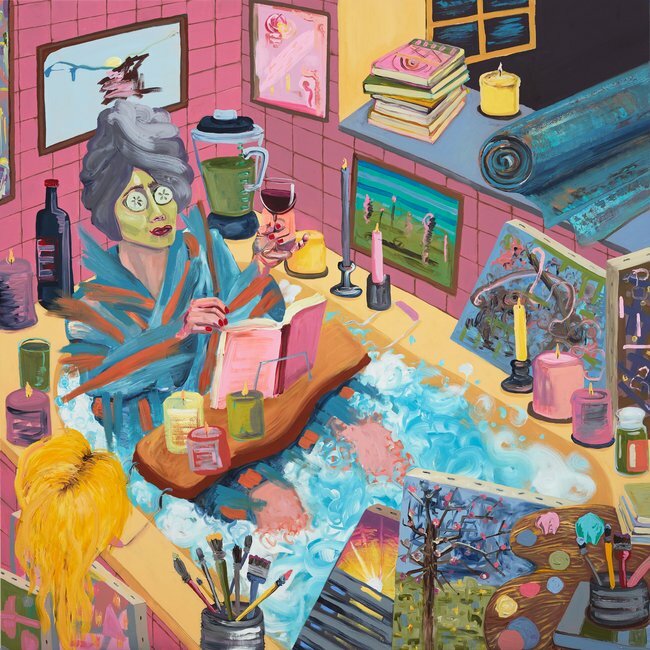 Amber Boardman has painted herself sitting in a bath wearing a face mask and a towel on her head. What does she have on her eyes? The bathroom is filled with things associated with wellness and relaxation. Notice the paintbrushes and canvases, the yoga mat, a blender with a green smoothie in it and piles of self-help books. What is the yellow object draped on the side of the bath? How many candles can you spot? How would you pose if you had to paint yourself? 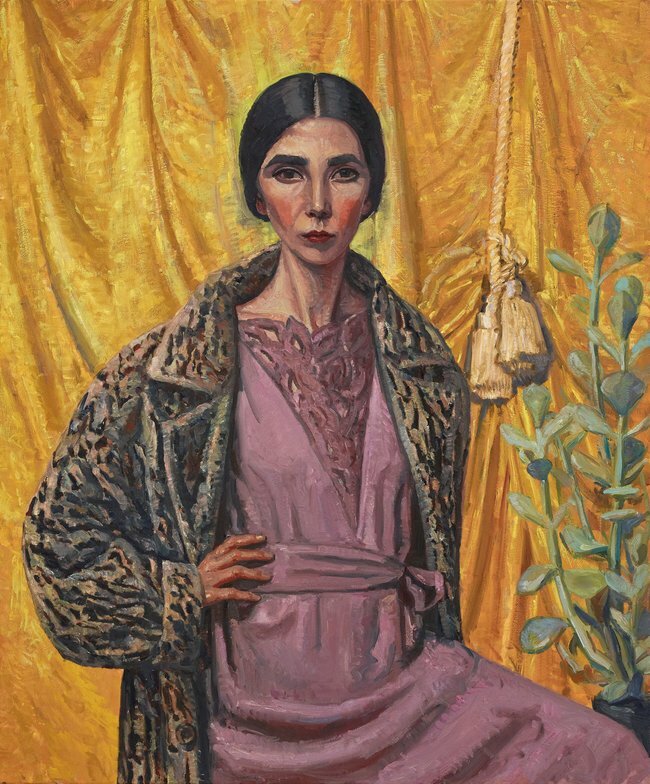 Yvette Coppersmith was inspired by the style of the Australian artist George Lambert to paint this self-portrait. She decided to pose with her hand on her hip wearing elegant clothing, just like the women who appear in Lambert’s paintings. Look at the attention to detail in the texture of her coat and the draped fabric in the background. Yvette had to pose like this for a long time. How long could you hold your pose? What items of clothing do you love to wear? This is a painting of artist Charlotte Drake-Brockman painted by David Darcy. Charlotte is a strong woman who isn’t afraid to speak her mind and is very comfortable with the way she dresses and presents herself to the world. 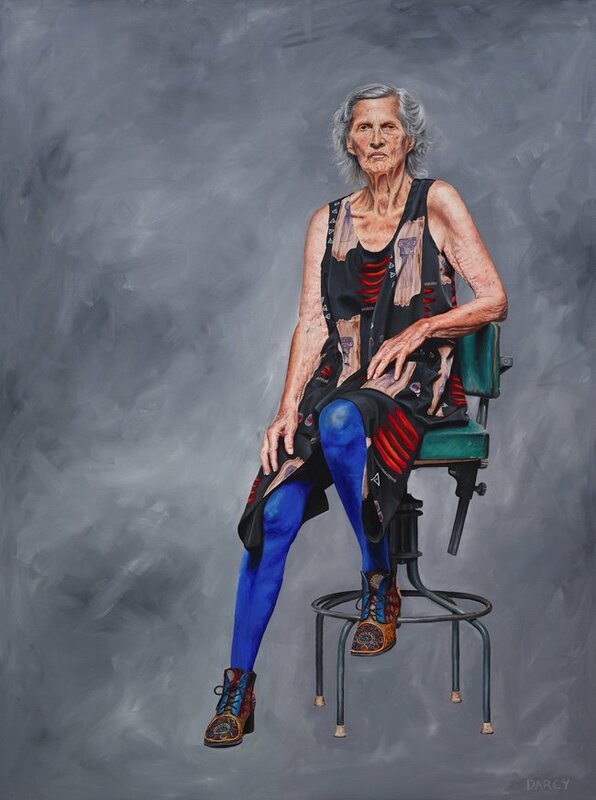 Spot the patterns on her boots, the bright blue of her stockings and her powerful gaze as she looks out at you from the painting. How would you like to dress when you are older? Will you have your own style? Is there something are you passionate about that you want to share with the world? Jonathan Dalton has painted his artist friend Abdul Abdullah sitting on a sofa staring out at us as if he is going to tell us something important. Abdul’s expression is intense but he is also calm, with his shoes off and his hands relaxed. His pose invites us to step forward and be part of a conversation. What do you think he is going to talk about? Marc Etherington has painted himself with a pet dog called Granny. But Marc doesn’t have a pet dog yet, he just wishes he did. 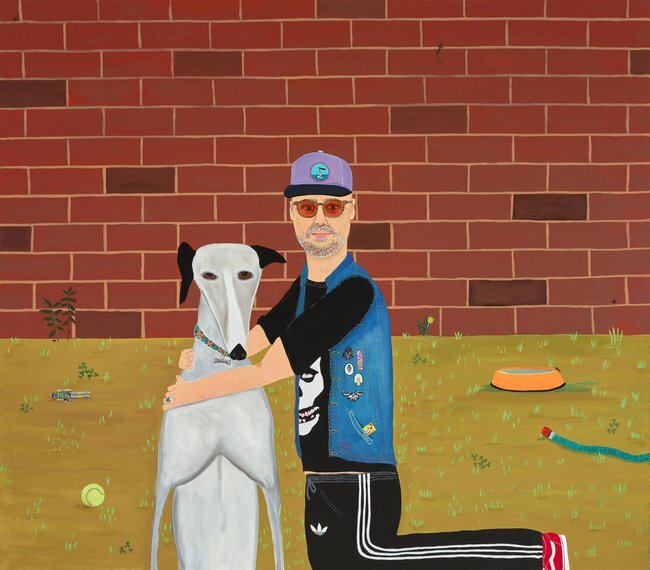 This painting imagines what his life would be like if he had a pet whippet. Have you ever imagined having a pet? What would you wish for? What things can you spot in Marc’s garden? What shapes can you see in this portrait? 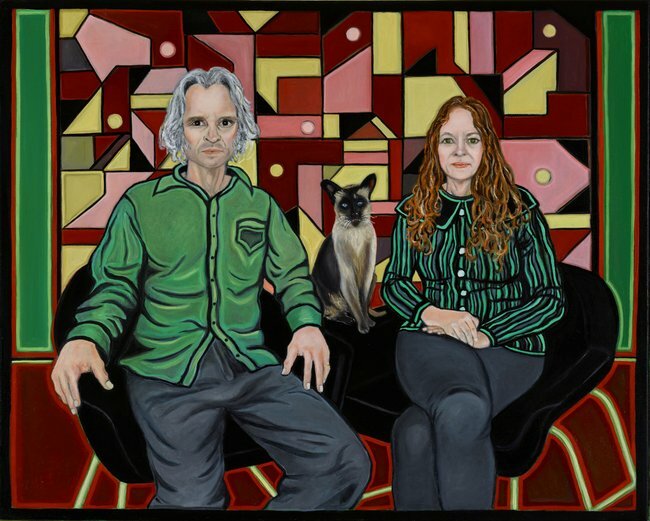 Marina Finlay has painted a portrait of artist and musician Peter O’Doherty and his artist wife Susan with their cat Coco. Behind them is a bold pattern inspired by one of Susan’s artworks. Notice how the colours and lines of the background pattern complement the clothes the couple are wearing and their chairs, creating a sense of balance and harmony. The black triangles in the background look like Coco’s ears. How many of them can you count? Where do you think these people are? Prudence Flint has painted her friend, the writer Saskia Beudel, relaxing by some water. She appears three times in different poses. Light comes in from the right and creates shadows, while the platform-like structure Saskia sits on cuts diagonally across the canvas with bold blocks of colour. What objects can you spot between the three Saskias? Imagine if three versions of you existed. What adventures could you have? Where would you pose for a portrait to show something about who you are? Pei Pei He has painted a portrait of art collector Theodore Wohng standing in front of his art collection. 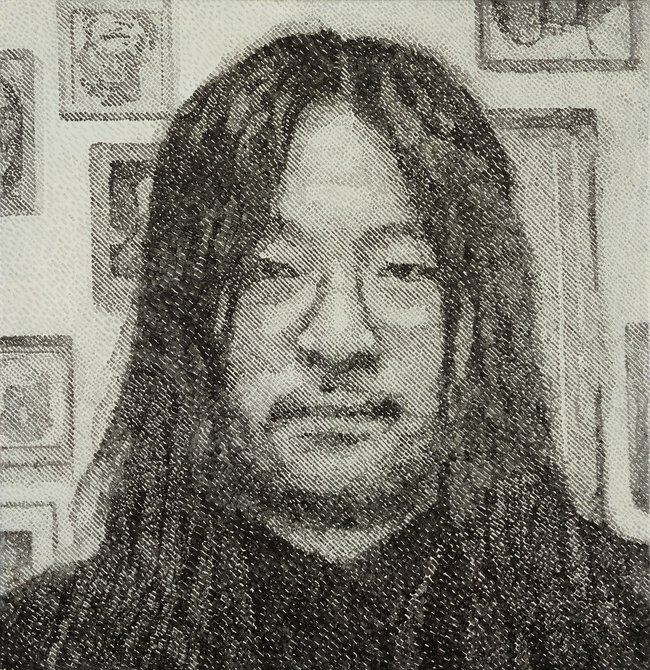 Pei Pei has used hundreds of little brushstrokes in shades of grey and black to build up the features of his face. Theodore is known for only wearing black clothes so Pei Pei has used tone to emphasise his signature style. Look at the portrait up close and then further away. What do you notice? Is there a special person in your life that you look up to? Artist Blak Douglas sees artist Uncle Roy Kennedy as a mentor and grandfather-figure in his life. 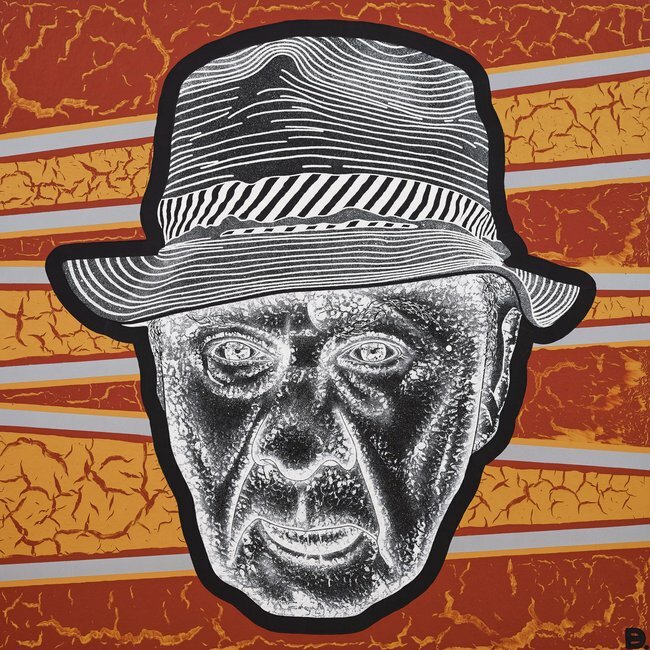 Roy uses printmaking and etching techniques in his own art so Blak Douglas decided to make Roy’s face look like a print in this portrait. He used cracked acrylic paint for the background so it would look like the dried earthy ochres of desert sand. How would you depict your special person? Does this portrait remind you of a famous historical person? 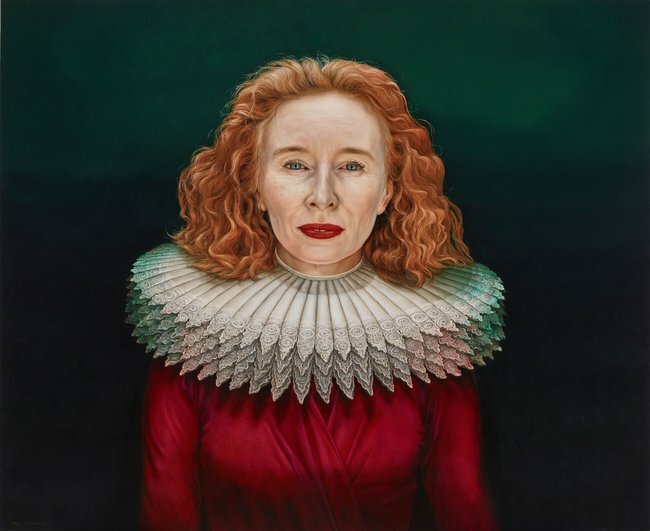 Paul Jackson has painted a portrait of the actor Alison Whyte as if she has stepped back in time to the 1500s – a period known as the Renaissance. Alison wears a large lace collar (or ruff) – the height of fashion at the time. Look at the intricate detail of each piece of lace. Describe the colours you can see in the collar and notice how it casts light on Alison’s face. Imagine wearing a collar like this. What everyday activities might become a challenge? What do you think you will look like when you are much older? 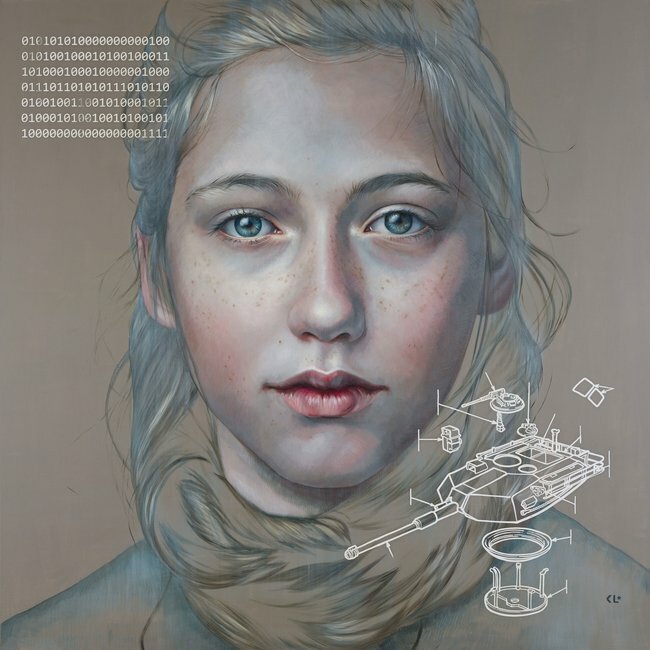 Kathrin Longhurst has painted her daughter Maia to represent her past, present and future. Overlapping Maia’s face is a diagram of a German tank, which symbolises Kathrin’s youth in East Germany during the Cold War. In the top left is binary code, a coding system used in the computers we now rely on in every aspect of life. Maia represents Kathrin’s future. Her generation will inherit the planet. See what happens when you stare into Maia’s eyes and move around. What type of bird do you think this is? 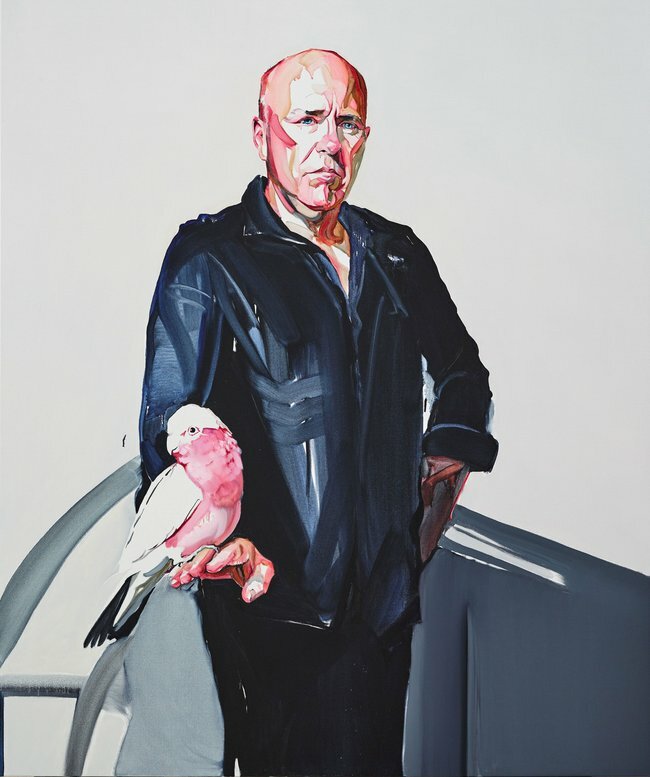 Writer Richard Flanagan stares out as us from this portrait with his pet galah Herb sitting on his hand. 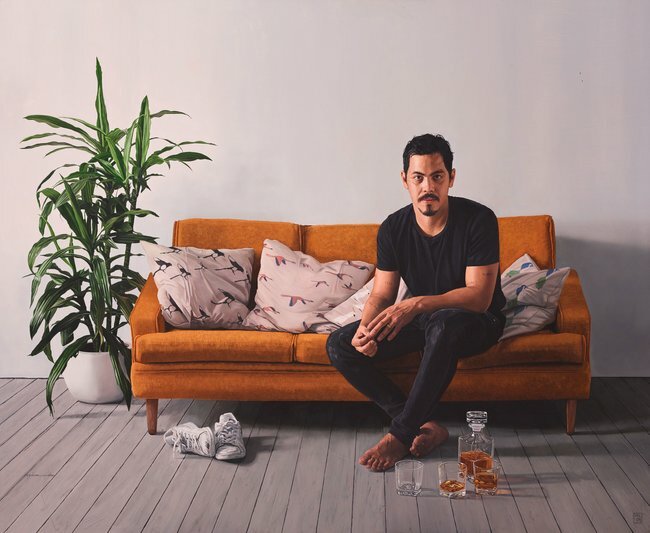 Artist Julian Meagher uses thin washes of paint, layering colours to build up the details and shapes. If you look closely you can see drips of paint. Delicate brushwork is used to create Herb’s feathers and similar tones of pink are used on Richard’s face. The background is bare, so where do you imagine Richard and Herb could be? Look at the detail in this portrait. 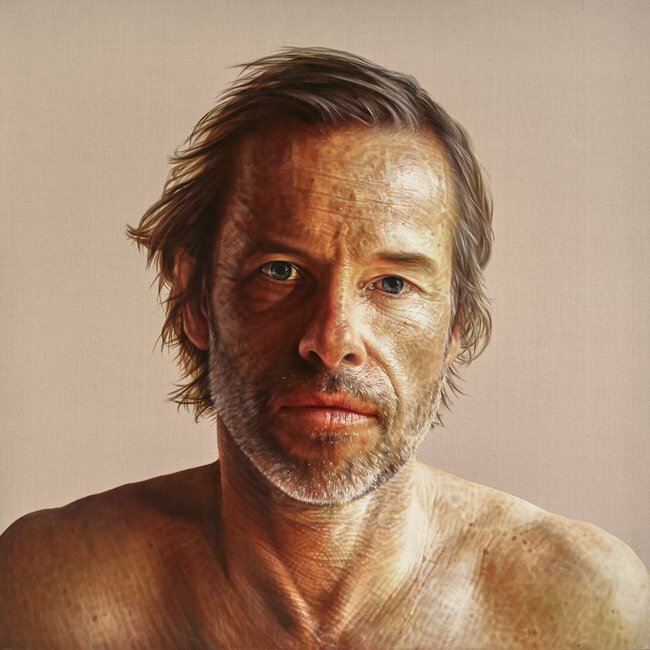 Anne Middleton has painted a large close-up portrait of the actor Guy Pearce. Bright light shines on his face from the right, creating dramatic shadows on the other side. Many layers of oil paint and glaze were used to build the texture of his skin, creating an incredibly realistic image. You can almost feel as if you are staring into the real Guy’s eyes. How long do you think this portrait took to paint? When did you last sit down and write a letter? 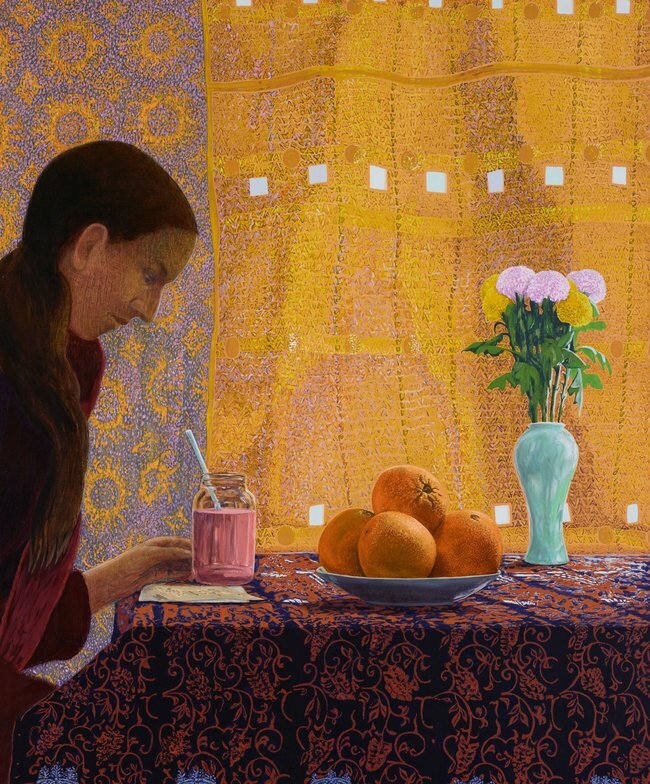 Stephanie Monteith has painted herself reading a letter sitting at a table with an arrangement of fruit and flowers on it. Dappled light comes through the curtain behind the table, softening the colours on the objects and creating a harmony of oranges and reds. Tiny brush marks create texture and detail and add to the calming effect of this portrait. What do you think the pink liquid is in the glass jar? What types of things make you nervous or anxious? Artist Kirsty Nielson suffers from anxiety and remembers being scared to perform as a pianist as a child. 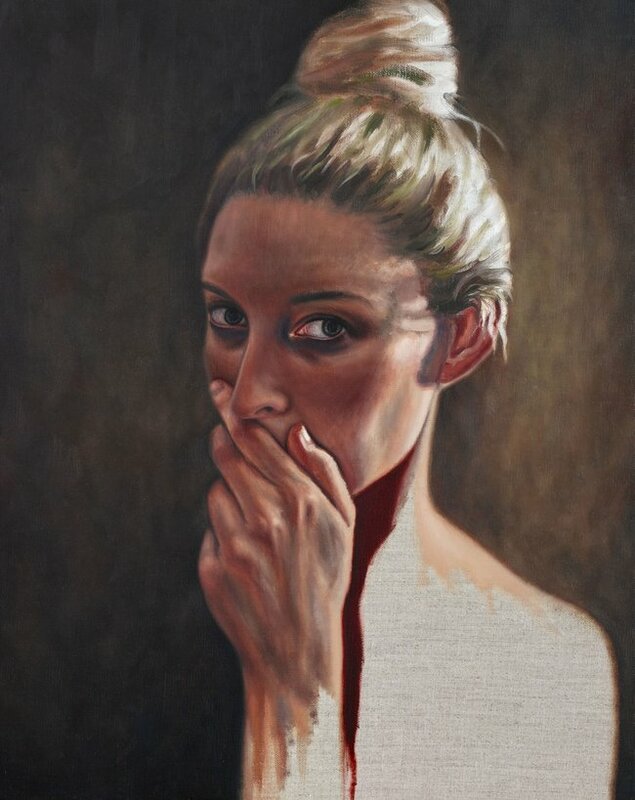 She decided to paint this portrait as a way of helping her face up to her anxiety and to challenge herself to stop trying to do everything perfectly. She deliberately included her hand in the portrait as artists often say hands are the most difficult part of the body to perfect. When you create a portrait, what part of the body do you find the most challenging to paint? What type of art materials do you like to experiment with? 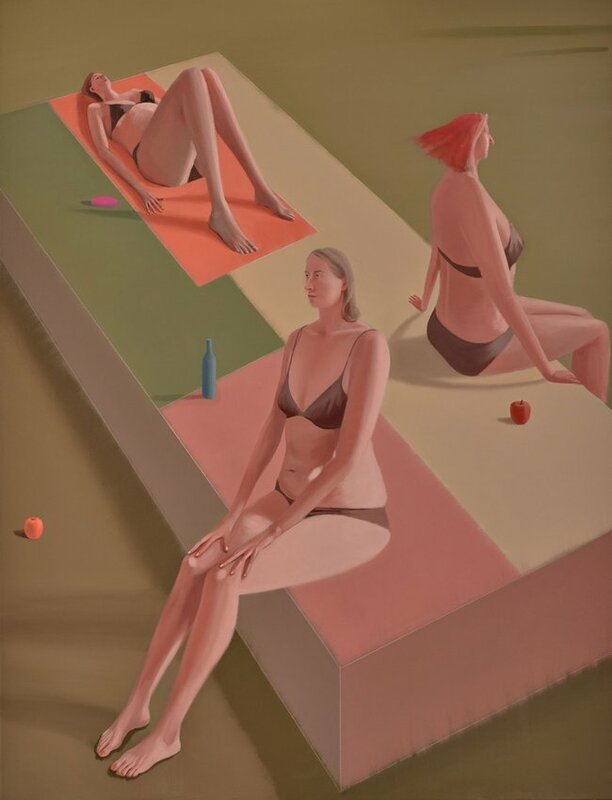 Tom Polo has painted a portrait of the artist Joan Ross using a limited colour palette and simplified shapes. 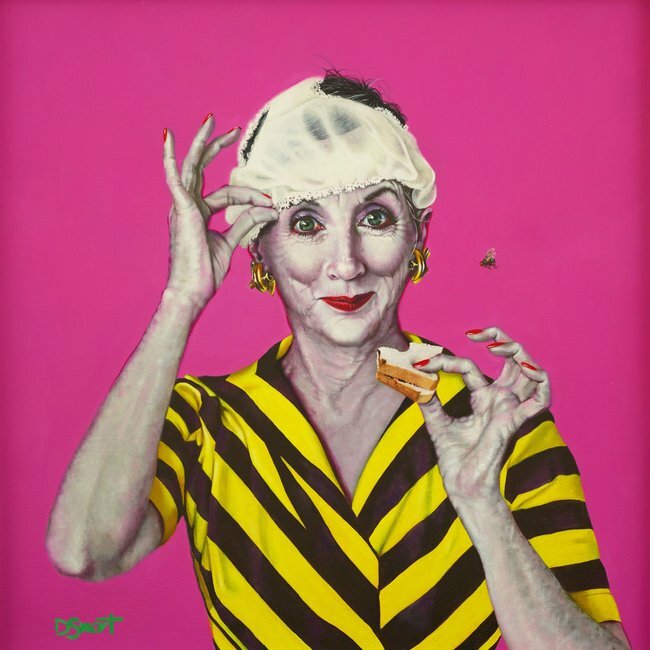 Joan often uses bright, fluorescent yellow in her own paintings so Tom was keen to use it in his portrait of her. The bright colour contrasts with the black forms and the added textures and lines make Joan almost camouflaged within the background. Stare into the painting and see if you can make Joan appear to move forwards or backwards depending on where you focus. Do you like having picnics outside? Meryl Tankard enjoys picnics but doesn’t like being pestered by flies, so she puts her undies on her head to keep them away! 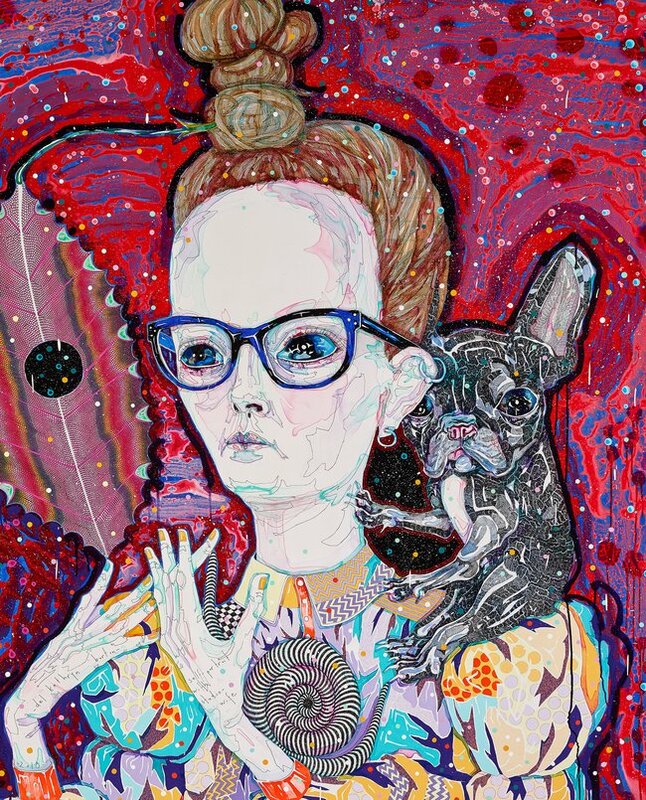 Artist Dee Smart has painted Meryl eating a Vegemite sandwich as a fly buzzes around her head. 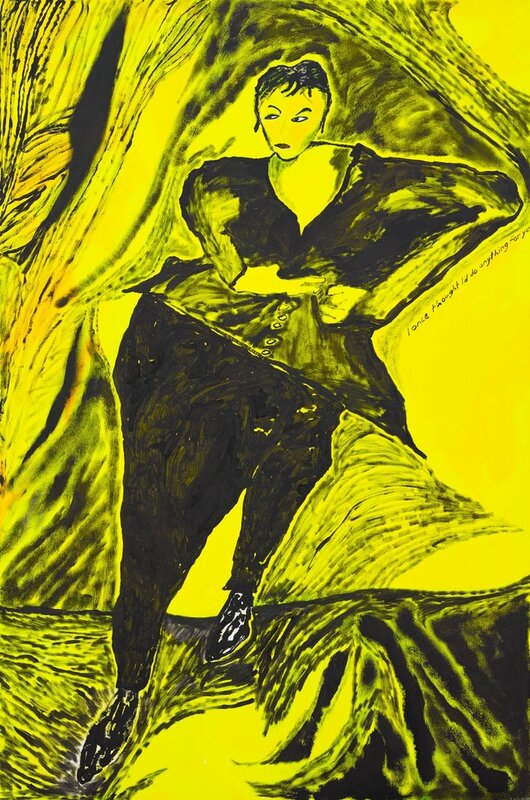 Meryl is wearing one of her bright dancing costumes and stares at us with a cheeky smile, which adds to the humour of this artwork. Copy Meryl’s hand gestures and create a dance move to go with this portrait. What is your favourite way of making art? Noel Thurgate likes to use collage and assemblage to make art. 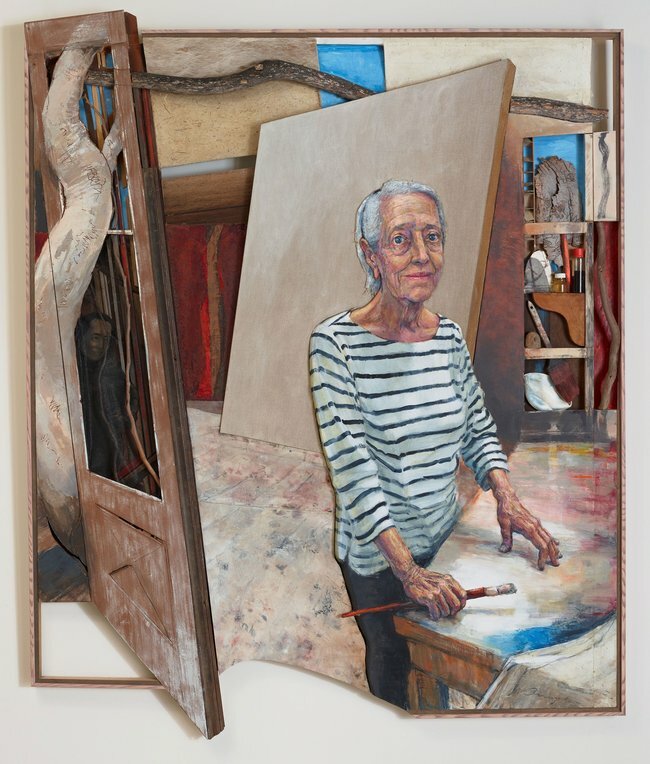 In this portrait of artist Elizabeth Cummings, he uses a combination of paint, found objects, cut wood and even real bottles to depict Elizabeth’s art studio. We can see the sky, trees and the bush through the doorways and windows. We can even see a younger version of Elizabeth peeking into her studio as if she can’t wait to make a new painting. Where do you like to make art? Salvatore Zofrea loves the colour blue. 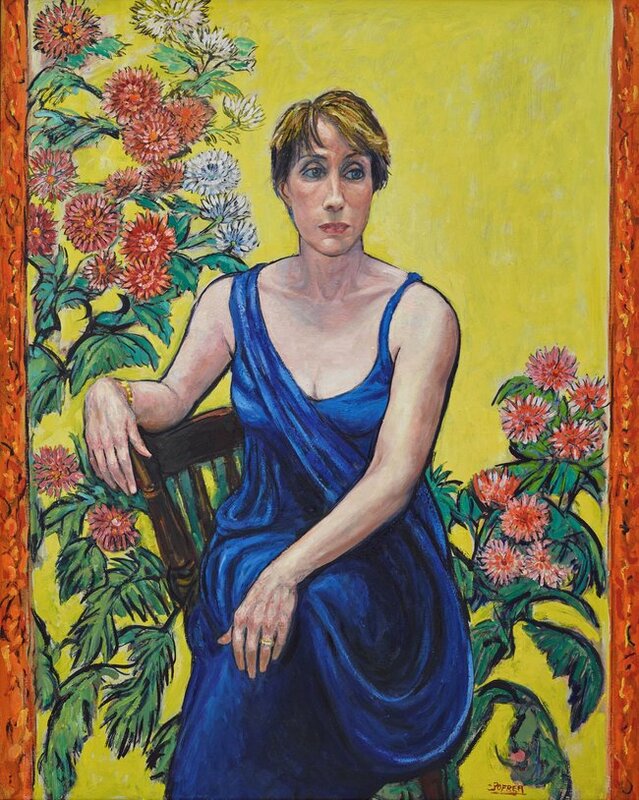 He used a pigment called lapis lazuli for the dress in his portrait of lawyer Sally Dowling, who sits in a chair with a decorative Japanese screen behind her. Look at the different brush marks he has used on the dress and the flowers on the screen. Notice how the smoothness of Sally’s skin contrasts with the background and adds to the elegance of her pose. We can’t see Sally’s feet, so what type of shoes do you think she would wear with this dress?